Most companies will tell you that loyal employees are their most important asset. What does that mean? How does a company keep the employees engaged in their job, feel valued and keep the company going in a positive direction? When employees are engaged and feel valued it shows in the quality of their work. Many employers today view their employees as overhead. Some organizations see employees as a line item on the accounting spreadsheet, somewhere between cleaning supplies and fuel expense. Employees that don’t feel valued or engaged will always perform at a lower level. The cost of letting employees know they are valued and keeping them engaged compared to unhappy employees is minimal. Disengaged employees are less innovative, discontented, less productive and more likely to leave. High rates of employee turnover can be costly especially when it comes to training. According to Entrepreneur.com unhappy workers cost the U.S. up to $550 Billion annually. At ASST we value our employees. We show our workers this by promoting and nourishing professional development, providing lunch for our monthly safety meeting, sharing stories/pictures of high profile jobs and sometimes just a “hey nice job”. Our management staff is not afraid to make some dust, often will help out in our fabrication facility an even help do installation. At ASST our employees are our most valuable asset. They know it and it shows in the quality of our solid surface fabrication. 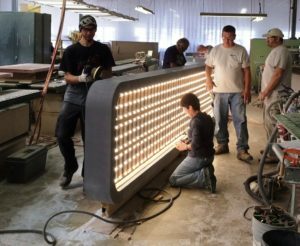 If you want your next solid surface project to stand out from the rest, let our employees fabricate it for you. Whatever you need, ASST can build it to your exact specifications, in a safe manner, and to the quality standards you expect. Contact us now online or call us at 717-630-1251. What Makes a Great Team? Creating a Culture of Going Beyond for Customers. Comments Off on What Makes a Great Team? Creating a Culture of Going Beyond for Customers. Athletic Teams work together in different roles to win a game. Good teamwork comes from members combining their specialized talents to achieve an end goal or resolution. The construction industry is a tough business. Building Professionals who are dedicated to embracing change and make the effort to work in concert with customers will reap the benefits of business success. The Customer is always right. The Customer is centric to our business. We have all heard these well worn phrases. How do we implement the creation of a great team of people working to their potential? A lack of alignment between employee’s desire to listen to customers and resolve issues is a very real problem for many organizations striving to create a customer oriented culture. At ASST, we strive to keep the customer focus with the alignment of our mission with our name and slogan. ASST (pronounced ASisST) keeps that focus in front of all employees. Going Beyond™ is our work ethic. Beyond Surface Level Solutions™ is ASsiSTing with challenges others avoid. Every week, the team has a meeting where a team member describes how he/she was Going Beyond for a customer on a specific project or internally with their team. The intended outcome for these meetings is to build an awareness of other team member’s contributions by “raising the bar” for professional behavior and peak personal performance. ASST also routinely solicits feedback from our customers which can provide a unique window into what our customers think and feel. Although the above steps can be difficult for any organization to implement, setting the tone for a positive culture of teamwork and great customer service will pay off in the future.